Not sure about his or her size or favorite color? Or, maybe they're picky and hard to buy for? 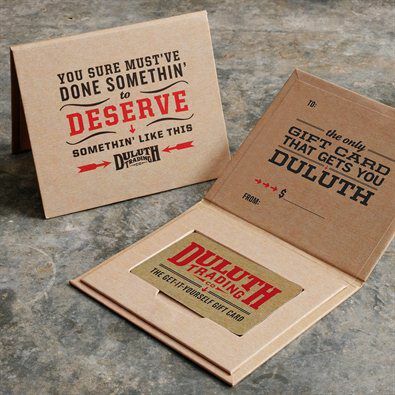 A Duluth Trading Gift Card lets them choose – guaranteeing they get what they want. For speedy delivery, it's shipped FREE via Priority Mail in a folded greeting card and envelope along with our latest catalog. Just add a personal message as you add this item to your shopping cart, so they won't forget who to thank. Choosy sonuvagun on your gift list? This'll always be a hit! Please note: Discounts don’t apply to gift card purchases. Gift cards are not redeemable for cash. You can use Duluth Trading gift cards with your online, phone, and mail orders, or in our retail stores. Gift cards are shipped separately from the rest of your order and do not count toward the purchase amount required to qualify for free shipping.